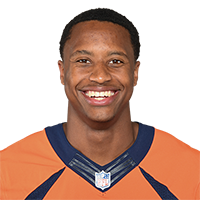 Denver Broncos quarterback Case Keenum finds wide receiver Courtland Sutton for a 19-yard touchdown against the Oakland Raiders. Published: Dec. 2, 2018 at 03:19 p.m.
Denver Broncos wide receiver Courtland Sutton notches a 30-yard touchdown catch from quarterback Case Keenum vs. Cincinnati Bengals. Published: Oct. 7, 2018 at 01:25 p.m.
Denver Broncos quarterback Case Keenum throws an 8-yard touchdown pass to Denver Broncos wide receiver Courtland Sutton, who toe-drags his way in the end zone for the touchdown against the New York Jets.